Lenticchie, or lentils, are a common menu item for New Year’s Eve/Day meals in Italy, often served with cotechino. They are supposed to bring good financial luck because of their shape like small coins. Well, we didn’t do the cotechino this year, but I did manage to come up with a way to enjoy our lentils. Pasta with legumes is a big thing in La Cucina Povera (peasant food/cooking); they’re both fairly cheap, always on hand, and together make a great stick-to-your-ribs dish. You’ve seen it before with Pasta e ceci, one of our all-time favorite meals, and now it’s time for Pasta e Lenticchie for this What’s Cooking Wednesday. I came up with this recipe by taking bits of online Calabrian recipes–adjusting things to our tastes. You may find that you want a little more tomato or that you like it more like a minestra, or soup. Please feel free to play. It’s hard to go wrong with these ingredients. Also note that I used already cooked lentils from a can because that’s what I had on hand; if you use dried lentils, check out these cooking tips for dried lentils. 1. Heat olive oil in medium pot and add onion, peperoncino, and tomatoes and let saute for a few minutes. 2. Add water, lentils, parsley, basil, and dry pasta. 3. Turn up the heat so that it comes to a slow boil and cook until pasta is done. If you need more stock to cook the pasta thoroughly, add a little at a time; alternately, if you just want more of a soup, add at least another cup of stock. 4. Test for salt and other flavors and adjust accordingly. 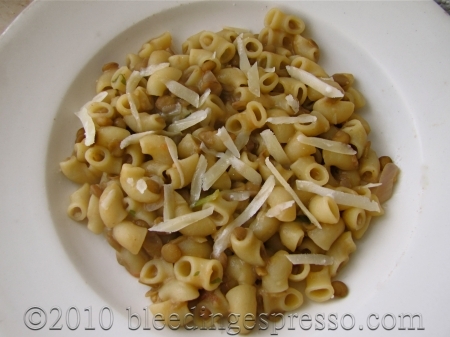 Serve hot with shredded Parmigiano Reggiano or Grana Padano cheese. This is good old fashioned Italian comfort food. Like American mac and cheese. Yum! .-= Lisa at Wanderlust Women´s last blog ..The rugged shores of Calabria, Italy call out to women with winter wanderlust =-. As an ardent fan of both pasta and lentils, I need to try this ASAP. It would be perfect to have on hand to bring in the office for lunch. .-= elizabeth´s last blog ..12.27.09: antojitos (exploring Mexican small plates) =-. My mother use to make a similar recipe. Here, in NM, we are limited with the types of pasta you can buy. Here, their main dish has green chili in it. Definitely would have this, I love pasta in a soup …a real winter warmer 🙂 oh we need it . This is a great warmer-up indeed, Anne; enjoy! .-= anne´s last blog ..More Snow!!!! =-. This would be perfect on a day like today. It’s cold and raining. The wind cuts right through you. Absolutely. Hopefully these types of days pass quickly into primavera…. I think I will substitute this dish or something else with lentils for our Southern version of good luck on New Years Day…..black eyed peas! This recipe sounds fantastic…can’t wait to try it! Thanks! Now that’s a high compliment; thanks Carolyn! I wish I had a bowl of this right now! anything with parmigiano reggiano calls my name loudly. have you any idea what REAL parmigiano reggiano costs here? And this is certainly a sad thing…of course we can’t find bacon very easily…. Was tasty indeed, Jillian; thanks for coming by! .-= Jillian´s last blog ..Week two and California Weekend =-. Looks and sounds delicious! My wife made lentils with sausage for New Year’s Day. Also delicious! WOW it looks delicious 🙂 I believe it’s really easy to make it fast. Cheers! *So* earthy! Great way to describe them! Sorry about the comment trouble though…I think it was payback because I’ve had a heck of a time trying to see your ICBINB video! Still, looks great! This looks like a good recipe to try. We did manage to eat the lentils and the cotechino, but on New Year’s Day, mind you it was only about 1am! That is the thing about New Years Eve here in Italy, you tend to eat so much beforehand, and then to fit in the lentils and cotechino, you need to wait a while to be able to do it! .-= Cathy´s last blog ..Buongiorno =-. It’s very cold here in the upper U.S. Midwest and your recipe has inspired me to move to the stove, boil the water, create your pasta and lentils and pretend, pretend, pretend that I’m in Italy and warm. Also, this may be a little close to home for you, considering your three kids, but I would love it if you would post a capretta recipe I could put on All Things Goat under Fantastic Food. Oh we’re capretta eaters too…just not *our* kids 😉 When I do a capretta recipe (we usually do a ragù), I’ll be sure to let you know. And thanks for coming by, Martha Ann; as you know I love your site! That sounds good. I am always looking for nice veggie dishes. I can imagine this would be great with oak smoked tomatoes too. I’ve never heard of oak smoked tomatoes, but I like pretty much anything smoked and I love tomatoes, so….sounds great to me! .-= Jenny Woolf´s last blog ..Lewis Carroll in USA Today =-. ok – then just come cook with me. Would love to! Especially if there’s bacon…. .-= Pete Perry´s last blog ..homemade pancakes and bacon… =-. My pot is on the stove as I write. I have wonderful childhood memories of trying to eat as many lentils possible on NY. My dad always told us we would earn a dollar for every one we ate. He’s been gone for a long time now, but the memories come back each NY as I prepare the dish – for my grandchildren! I will also try your recipe as its sounds wonderful. Thank you and Happy New Year. Hope you enjoyed your lentils and that they do indeed bring you good luck in 2011! My mom (who’s family was Calabrian) made a porkette on NY day for the same reason. It brought prosperity. When making my porkette this year, I remembered the pork sandwiches that my father used to bring home from 9th Street in Phila. They were pork, peppers and gravy on Italian rolls and were the BEST. I have tried to duplicate that recipe over the years with no great success. I went to 9th Street two years ago to find that place and it was long gone.